Spending lots of time on Facebook, you come across some fun pizzerias. 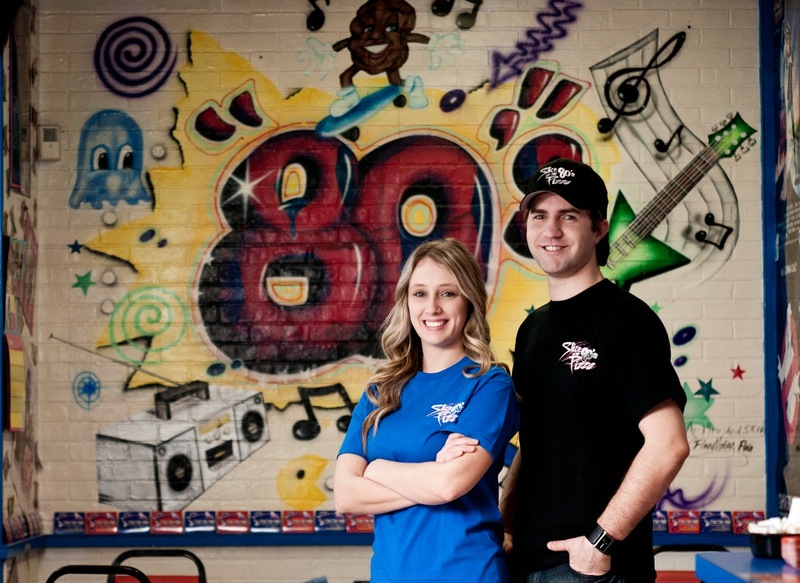 Hence why I just had to ask Adam and Natalie Matt, owners of the Slice of the 80's Pizzeria, just what makes their page work. Slice of the 80's: We like to run a diverse/entertaining social media page, and since we are an 80's themed pizzeria we have a lot of topics and content that we love to share with the public, we always try to keep our social media fun, entertaining, and sometimes money saving! Slice of the 80's: The ones that get the most attention are the money saving ones, when we do 50% off our specialty pizzas or giveaways, they seem to get the most views because people like and share our posts with their friends or tag their friends and that brings people to our page that may have never had us or even heard of us. Slice of the 80's: Don't look desperate! Don't over post! We could post pictures of pizza after pizza all day long but that would get boring we feel, so instead we mix things up and since we are an 80's themed pizzeria we like to do trivia, add pictures from the 80's, do giveaways and surprise people with half off deals or free items every now and then, it tends to keep things exciting and attract more people to our social media page. Also, share information about your pizzeria here and there but slip it into a post that's not directly selling to the customer, for example you could ask a question if you want everyone to know about a new flavored crust you have you could write, "What's the best flavored crust to go on our Hawaiian pizza? Our favorite is our NEW Butter Parmasan!" PMQ: Do you all do your social media or hired a pr firm? Slice of the 80's:We do all of our own social media. We feel it's fun, and easy to do. We know our customers better than a hired company would, because we are the ones making the pizzas, interacting with the customers, and listening to what people are saying to us and what they still want to know about our company. We feel we can do a better, more personal interaction on a social media site with our customers than any hired pr firm can because we know our restaurant. Also, the great thing about being in control of your own social media is when there is a slow time in your restaurant you can put a great deal online and immediately get the phones ringing! Slice of the 80's: It's OK to not post daily, sometimes if you are constantly posting and flooding peoples news feeds they might block you or better yet, delete you because you are over posting. It's great to constantly be out there promoting and getting your logo recognized and building a brand but sometimes it's OK to skip a day because the next day when you have some valuable content to post it will seem twice as powerful! Slice of the 80's: If you don't have any social media then you're missing out! It's a great way to interact with your customers and get new customers. With all this social media getting bigger and better and new things coming out, a pizzeria without it is missing out on lots of free advertising! Ranging from people checking in to your restaurant and letting their friends and family know where to go to get a great pizza or having a customer upload a photo they just took of your great food that you just served them. Social media is like a snowball and if you have a great product that can back it up, your page and social media will get bigger and bigger on its own without having to do a lot. You just have to set it up and watch the new customers on your page add up! !